Hello friends! It took me quite a while in composing this blog post. Blame it to my lazybones the past few days. haha. Honestly, I couldn't start the post because I can't think of a good title. Yeah. I can't write a post unless I already have a title to match it with. hahaha. I was on my way home today (or tonight?) when an idea suddenly popped in my mind. Seven Little Secrets. Sounds intriguing. Few days ago, Ventocosseus gave me an award! 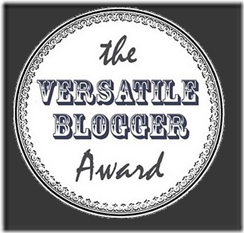 It's called "Versatile Blogger Award." Last December 2011, I also received the same award from a fellow blogger. Though I don't see myself as 'versatile' per se, it still feels good that people recognize this blog and it encourages me to continue doing what I have already started. Give thanks to the one who gave you the award. Don't forget to backlink him/her. Post seven things about you. Share the award to 15 other bloggers that you think are worthy and tell them that you gave them the award. Mr. Ventocosseus of The Toilet Thoughts, thank you from the bottom of my liver! hehe :) To my readers, why don't you hover your cursor over here and visit his blog? I'm telling you, you won't regret spending some time in his blog! To comply with rule #2, I have come up with these seven little secrets [which are already known by few people, so technically, they're not secrets at all. hahaha] I won't list down the same things I've already shared here before. I first used the pen name "ice" when I was in highschool. I tried out for our school paper and we were required to submit our sample article using a pen name instead of our real name. Perhaps it was done to prevent the judges/advisers from being bias. Well, I was lucky enough to be chosen as a writer in that paper. During friendster days, I started having interest in blogging. I used littleangelonearth as pen name that time. Too bad, friendster blogs were taken down. :c Later on, I used littletenshi as pen name. Why? Tenshi means angel in Japan. hehe. I first used lilyonearth.blogspot.com as URL for this blog. After that URL was indexed in google, I changed it because I've seen another site with quite similar URL. haha. Well, I was just a newbie back then, so, I got scared that my blog would be suspended just because my URL is similar to hers/his. lols. I love buying books. Whenever I am in the mall, I'd go to the bookstore and buy books that seem good to read. But sometimes, the books just rest in my cabinet when I couldn't find time to read them. hehe. I'm not much into fashion. I wear clothes that make me feel comfortable. I still love cute shirts, cute shoes, sandals and bags. When I say cute, that means what you can see teenagers are wearing/using. I'm still a kid at heart and my mother would always tell me, "Magpalit ka na nga ng image. Yung mga gamit mo puro pang-sanggol e." hehe. Seriously?! I was hospitalized due to Dengue Fever when I was in college. I survived. Then I was hospitalized again just last year due to pneumonia which had complications. I had heart problems. Literally. I guess I really have nine lives after all, ey? The seven things above came in randomly. haha. So, that's all I could share for this post. You'll learn more about me by simply hanging around this site. hahaha.